A daughter's wedding is very important event in a man's life. He wants to look perfect. But to dress for a wedding should be in accordance with the generally accepted rules. There are several acceptable options suit father of the bride. The bride's father is a very important guest at the wedding. Without it, the ceremony certainly will not do. So you just need to look better than the groom his beloved daughter. He has a very important role to convey the bride worthy of her chosen one. So the choice of costume should be approached seriously and to follow the General rules. You should consider the fact that the pants cannot be too short. They should cover the top edge of the shoes. It is also necessary that the collar of the shirt is a tight fit neck. Well, the cuff should be approximately two centimeters peek out from under the sleeves of his jacket. The choice of tie is a very important process. Better if in color, it is combined with the tone of the evening toilet. The best option is tie calm warm colors. For example, multi-coloured tie with a pattern will look ridiculous on a classic wedding ceremony. Usually wear a colorful tie if the wedding is stylized. Very impressive will look butterfly pastel colors combined with an evening suit. Socks should be selected so that under the counter of the pants was not noticeable the rim of the sock in a sitting position of the bride's father. It is advisable to purchase shoes that fit the costume and tone. However, allowed the use of classic black shoes with a grey suit. Regardless of colour the shoes should be closed toe and heel. 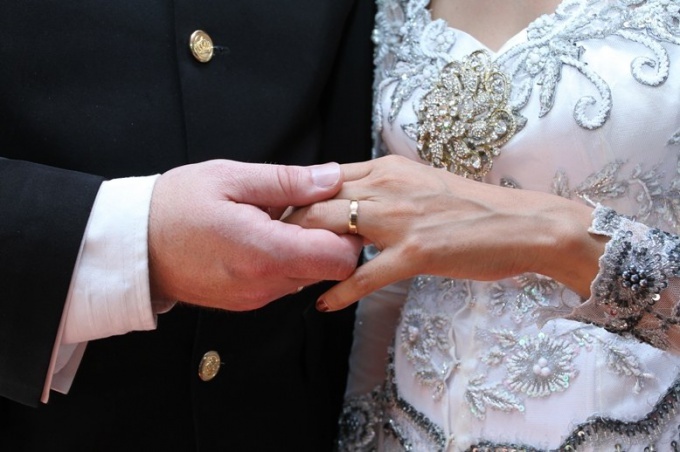 After studying the General requirements to suit the bride's father can begin to the selection. Classic suit in black or dark gray would be particularly impressive to look at the age man. A mandatory element of this outfit should be elegant boutonniere. In the summer time you can wear a light suit of light color and pick it in the tone of elegant shoes. The father of the bride can wear an elegant tuxedo or tailcoat to wear a bow tie and starched white shirt. Such suit is ideal sash and patent-leather shoes with pointed toes. Perhaps in this form I can even outshine the groom. Do not forget that the selected style to some extent will reflect your inner self. The main objective of the bride's father is transferring his daughter to another man for happy life together and not a competition in costumes with him. Wedding celebration – a wonderful, bright and memorable event not only for the couple themselves but also for their parents and all invited guests. After the celebration always remain memorable photos, which look respectively this great event. It is worth remembering that the parents at the wedding is the second highest figures after the bride and groom. That is why they should pay special attention to your wardrobe. Clothing for parents should be cleverly chosen and thought out. For example, in order for ladies to look most elegant, you can wear short or long dress for special occasions. Remember, however, that a fully white dress can be just the bride herself. Black solid color - also not the best option for women. Also not suitable red, dress with shiny sequins or too deep neckline and open shoulders. Therefore, prefer neutral colors and modest cut. For example, mother of the bride at the wedding can afford to wear a dress or a suit of pearlescent, pastel go any other light shade. The wedding celebration usually lasts a whole day, so the choice of shoes be mind. It is desirable that the shoes were not only elegant but also comfortable. In the most extreme case take a pair of replacement shoes. Ladies, better to give preference to low-key and relaxed gold or silver jewelry sets. A man can wear to a wedding any festive costume, whether it is plaid, striped or solid. You can not use the tie, but it is a desirable addition to the costume. If the celebration is informal, wear one color shirt and jeans, but avoid sports and old clothes. Use the perfume in moderation. After all, the celebration usually takes place in the presence of a large number of invited guests. And the abundance of sharp flavors can be unpleasant to others. When choosing clothes, if the wedding is in the winter, give preference to classical style. Of course, the room does not have to be in a jacket or coat, but maybe you will be shooting a camera or camcorder on the street. Pay attention to your headpiece. Ladies can be present in the room with the head covered, unlike the male. Hat does not have to be extravagant. The outfit, worn to a wedding should not overshadow the dresses of the bride or groom as it will look disrespectful to the heroes of the occasion. It is desirable that the mother of the bride and groom have agreed before the start of the celebration, in any outfits they will be. Harmoniously the wedding dresses look about the same length and similar styles. Of course, the bride and groom are the main actors in the wedding party, their outfits have to be the most beautiful and attract everyone's attention. However, as the stone requires a worthy setting, and the parents of the newlyweds should look the part and stand out from the crowd of guests. Men are easier – usually of sufficient quality costume, but moms will have to choose from a variety of options. According to etiquette, before the mother of the bride bought the first dress, and then reported the mother of the groom the colors and style of her dress. This was done to ensure that mothers of young people were dressed in the same style. However, today the parent of a young man can justly be offended by such a neglect of its interests. Therefore, mothers should choose their dresses for the wedding either together, or in agreeing on the design of their dresses or suits. When choosing a dress for mother of the groom should take into account the type of appearance, shape, taste. 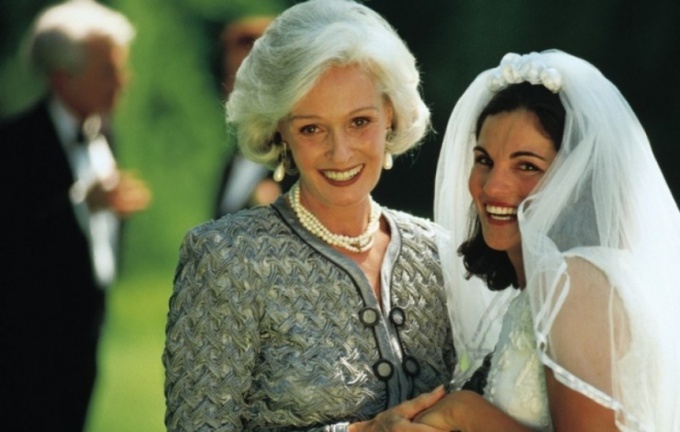 If the mother of the bride – blonde, and the groom's mother – the burning brunette, of course, they do not fit clothing of the same color. In this situation, you should choose clothes whose color will blend in with each other. For example, the mother of the bride can wear a peach dress, mother of the groom – olive. Attire and mother of the groom, and the bride's mother should be either warm or cool shade. The only taboo – it is a white color. If the bride has chosen wedding dress champagne color or ivory, your attire needs to be at least a couple of shades darker. Outfit mother of the groom should be elegant. Fit mid-length dress, suits-two and three. Trousers are also accepted. It is desirable that all elements of the toilet was the same color. The variety of colors in your outfit at the wedding is not desirable. Wedding image perfect complement to the family jewels – gold jewelry with diamonds, pearls, semi-precious stones. 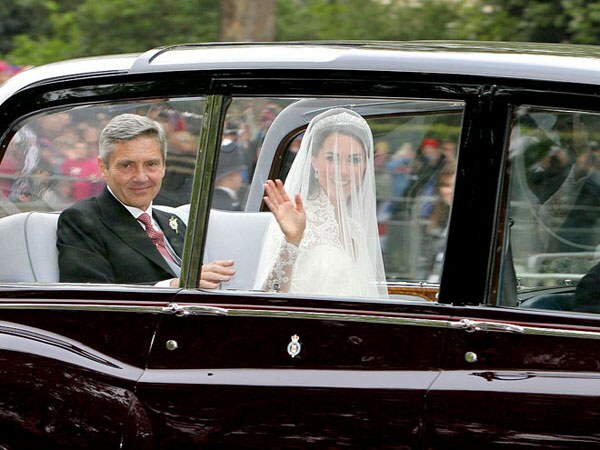 The dress can be decorated with expensive embroidery, beads, bugles. Striking the final note will look the shirt or tie of the groom's father, chosen to match the outfit of his wife. Then the parents of the young man will look impressive and harmoniously, giving the palm a couple.